One of the rarest and most collectible motorcycles in history. 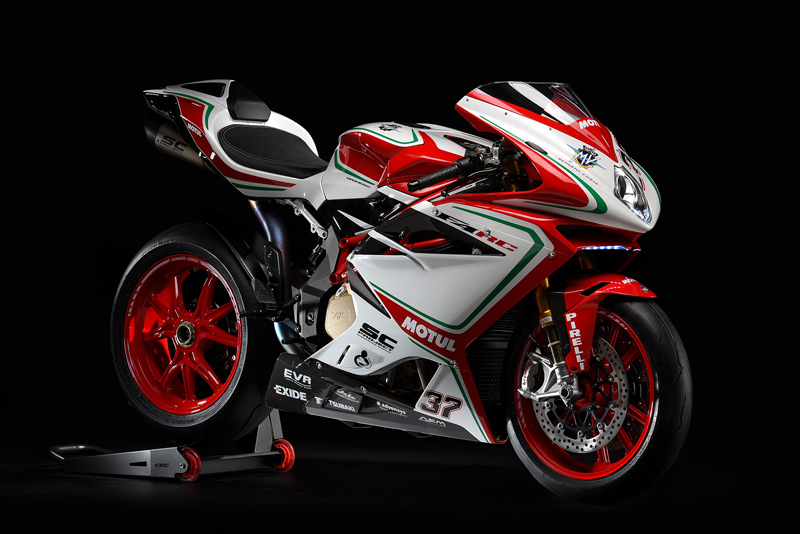 MV Agusta’s Reparto Corse range is designed for a unique clientele: enthusiasts that are passionate about performance, and fanatics of design. 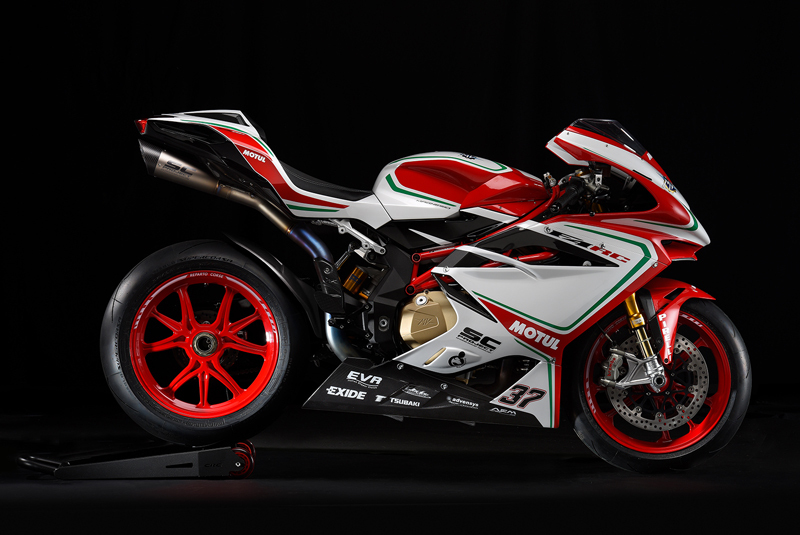 STATE-OF-THE-ART MVICS SYSTEM: As for the engine, frame and components, the F4 RC represents the pinnacle of MV Agusta’s evolution in the field of electronics. The MVICS provides for instant adjustment of the dynamic behaviour of the bike (Normal, Sport and Rain maps), as well as a personalised Custom map. The Full Ride by Wire throttle, the 8-level traction control and the EAS 2.0 electronic up & down gearbox completes the package. EXCLUSIVE COMPONENTS: The RC features a number of exclusively designed and developed components that are utilised solely on this model, such as: the cylinder head casing with high-flow intake and exhaust ports, ultra lightweight forged pistons, titanium connecting rods, magnesium covers and titanium fasteners. Specific full carbon fibre side fairings aiding and numerous titanium fasteners. THE MOST POWERFUL EVER: With its 212 hp (at the crankshaft) at 13.600 rpm, the F4 RC in race track configuration, represents the pinnacle of the extraordinary 4-cylinder MV Agusta “Corsa Corta” evolution. A very unique engine employing F1 technical solutions such as the radial valve configuration mated to a central cam drive system. THE BEST PARTNER FOR YOUR SAFETY: The racing vocation of the F4 RC is supported by the accurate control algorithms of the two-channel Bosch 9 PLUS ABS with race mode, that steps in only when strictly necessary, thus leaving the rider full control of the bike. In addition, the F4 RC features the RLM device (Rear Wheel Lift-up Mitigation) to avoid overturning when braking too harshly. RACE READY: You will find the F4 RC the perfect bike for track days as well as, at home on the most legendary circuits of the planet. You will also appreciate the heart-stopping design and the maniacal refinement of every single detail. RACE TRACK EMOTIONS: There is a lot more to Reparto Corse (Racing Department) than just a graphic makeover. RC embodies the racing spirit and technology instilled into a road bike. 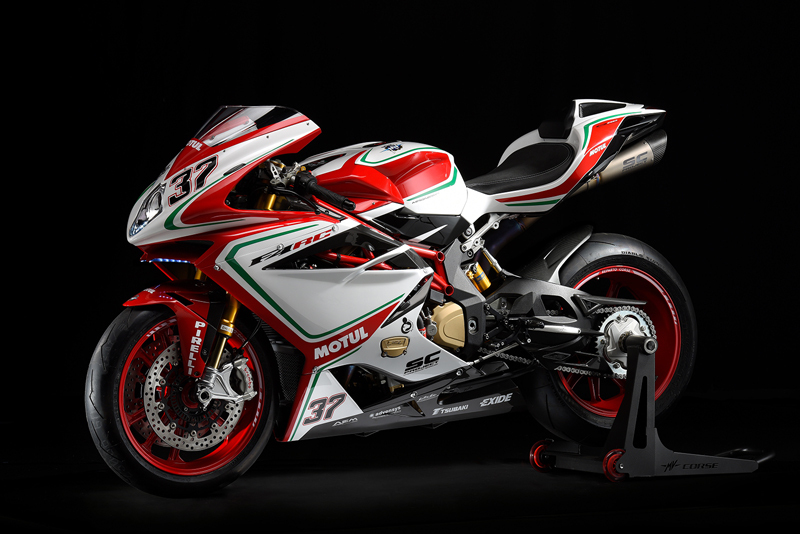 PERFECTION FOR OVER 20 YEARS: The F4 RC is instantly recognisable with a stunning red and white graphic base as used on the official racing World Superbike Championship version, including sponsor logos. THAT WINNING FEELING: The “37” is a reminder of the manufacturers World titles won by MV Agusta. Front - Forged aluminium alloy 3.5 x 17 in. Rear - Forged aluminium alloy 6 x 17 in. 84.82 ft. lb. (115.0 Nm) at 9.300 r.p.m.